There's a huge range of Castles in Northern Ireland. These beautiful old buildings range from 800-year-old Medieval fortresses to modern castles which were built in old style. Here are a list of castles in northern counties of Ireland. 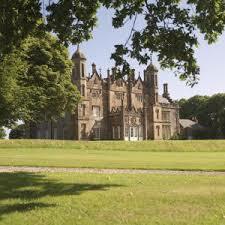 Later down the page we will look at a modern day castle in northern Ireland called Belfast Castle. This is one of the most popular tourist attractions in Belfast. The following list is by no means a complete list of castles in northern Ireland but it does show the extent of their impact when the Normans came from England over 800 years ago. That lists many of the Castles in northern Ireland. They are varied and you can see that the counties of Ireland such as Antrim and Down have the greatest number. One of the most famous castles in northern Ireland is probably Dunluce Castle in County Antrim shown in the photos of castles above. It's a vast, grey stone ruin, which juts out into the sea. It's hard to convey just how impressive the setting of Dunluce Castle is and the edges of the crag are sheer cliff faces. In contrast one of the more modernised and popular visited castles in northern Ireland is Belfast Castle which is now reviewed. There's no better place to go ghost-hunting than an ancient castle and,perhaps, no better place to actually find castle ghosts of Ireland than an ancient castle in Ireland. Whether it's from visitors to lonely castle ruins, private residents of castles or guests and staff of castles-turned-hotels, there have been enough reported castle ghosts of Ireland sightings. Glenarm Castle, County Antrim - One story about Glenarm Castle relates that there was so much paranormal activity there that the lady of the castle had every room exorcised except the attic - to which, the story continues, all the ghosts immediately retreated! One of the best castle hotels in Ireland at the water's edge of Lough Eske, County Donegal near the fabled Blue Stack Mountains in northern Ireland counties, you escape into a luxurious world of relaxed elegance and attentive service. To find out more about Lough Eske and other top northern Ireland hotels just follow link. Where about is Belfast Castle? The Belfast Castle building that stands today was built from 1811–70 by the 3rd Marquess of Donegall. It was designed in the Scottish baronial style by Charles Lanyon and his son, of the architectural firm Lanyon, Lynn and Lanyon. After Donegall's death and the family's financial demise, the 8th Earl of Shaftesbury completed the house. It was his son, the 9th Earl of Shaftesbury, who presented the castle to the City of Belfast in 1934. In 1978, Belfast City Council began a major refurbishment over a period of ten years at a cost of over two million pounds. 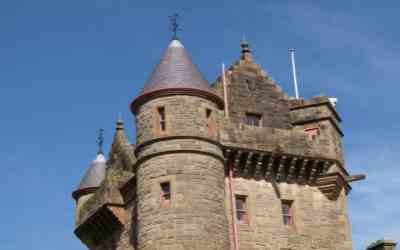 The Belfast Castle building officially re-opened to the public on 11 November 1988. There's loads to see and do at Belfast Castle, whether you're visiting with friends or taking the family for a day out. The Estate is a popular area for walkers, hikers and cyclists, who enjoy waymarked trails around the grounds before popping inside for tea or coffee or something light to eat. It is situated on the lower slopes of Cave Hill Country Park in north Belfast. It contains both parkland and mature mixed woodland and offers superb views of the city from a variety of vantage points. The Belfast Castle estate is home to many different species of wildlife, including long-eared owls, sparrowhawks and Belfast’s rarest plant, the town hall clock.Its most famous feature, known locally as Napoleon's Nose, is believed to have been the inspiration for Jonathan Swift's novel, Gulliver's Travels! There is also the offer of refreshments , scenic views, full car parking facilities and a wide variety of wildlife. Belfast Castle Estate is adjacent to one of the highest spots in Belfast, Cave Hill, offering great views over Belfast Lough and the city. For generations, Cave Hill has been synonymous with Belfast, with its imposing outline visible throughout the city. The landmark, named for the five caves located on the side of the cliffs,contains a wealth of natural, archaeological and historical features, including Belfast Castle. Belfast Zoo is also just a short distance away, at the top of Antrim Road. The Cellar Restaurant within the castle is open every day from 11am - 5pm serving snacks, light refreshments and lunch as well as a traditional Sunday lunch. The restaurant is open for dinner until 9pm on Tuesday to Saturday evenings. Cave Hill Visitor Centre is located on the second floor . This fascinating and intriguing museum is open Monday to Saturday, 9am to 10pm, and Sundays from 9am to 5.30pm, and admission is free. Or, if you’re browsing for a bargain, pop into Castle Antiques, located in the cellars of the castle itself, and take your pick from paintings by local artists, jewellery or other collectibles.